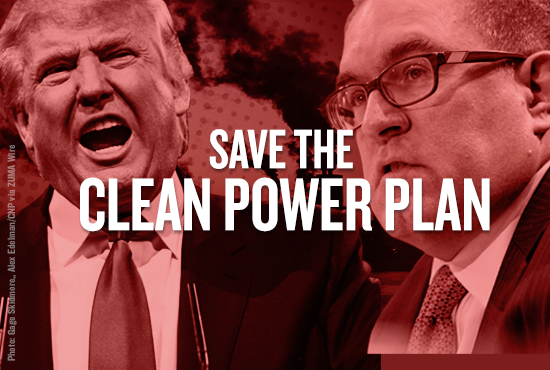 President Trump and his allies at the EPA just introduced what we’re calling the “Dirty Power Plan” — their disastrous scheme that would replace the landmark Clean Power Plan. The Clean Power Plan is our best chance to reduce carbon pollution from coal-fired power plants and accelerate our clean energy future. Trump’s rollback is nothing more than a giveaway to fossil fuel companies and utilities that leaves the rest of us to pay the price with extreme weather, poisoned air and water, and a polluted planet. The EPA is accepting public comments on Trump’s new plan. Tell the EPA that you stand united with thousands of Americans who support the Clean Power Plan and will fight back against any attempts to dismantle it — in defense of our clean air and water, our climate, and our clean energy future. President Trump and his allies at the EPA just introduced what we’re calling the “Dirty Power Plan” — their worse-than-do-nothing scheme that would replace the landmark Clean Power Plan. Tell the EPA that you stand united with thousands of Americans who support the Clean Power Plan and will fight back against any attempts to dismantle it — in defense of our clean air and water, our climate, and our clean energy future. Dear EPA officials: I oppose President Trump's attempts to dismantle the Clean Power Plan and replace it with a new, pro-polluter "Dirty Power Plan." Power plants are one of our single largest sources of global warming pollution. And if left in place, the Clean Power Plan would ensure that the power sector reduces pollution by 32 percent below 2005 levels by 2030. Trump's replacement proposal is a pitiful and weak replacement that is riddled with gimmicks and giveaways to fossil fuel companies and utilities. It would give states the power to set their own weak standards -- or potentially opt out of imposing any standards -- to limit pollution from coal-fired power plants, which would boost carbon emissions by billions of tons. This is a "worse-than-do-nothing" proposal. It could encourage even more pollution from power plants, and creates loopholes to get around Clean Air Act restrictions on that extra pollution. Between megafires in California, an unprecedented toxic red tide bloom in Florida, and record heat waves from Texas to Japan this summer, we can no longer ignore the perils of global climate change and their impact on millions of people around the world. Trump's plan would only exacerbate these devastating impacts and drive us closer to climate catastrophe. I stand united with thousands of Americans who support the Clean Power Plan and will fight back against any attempts to dismantle it.